Vegetable oils are naturally found in a wide range of plants. Each plant provided separate and distinctive oil. However, only few of these plants are exploited for their economic importance. Vegetable oils have a major role in human nutrition. They provide a high energy source and contain distinctive fatty acids which are essential for health and these are not developed by the human body. The major source of vegetable oils is the seeds of annual plants and oil-bearing trees. Nowadays and with the word increase demand on vegetable oils, oil-processing industries searches for new exploitable sources. Recycling agricultural wastes constitutes one of the pertinent alternatives for the production of edible oils. Date palm seeds are promising source for this purpose. 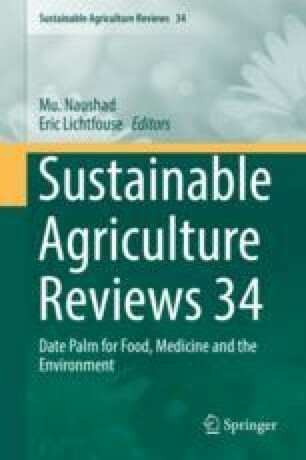 The aim of this chapter is to present up–to–date data on the different extraction techniques used for getting Date seed oils (DSO) from different sources and leading to different yields. These extraction techniques included (i) cold pressure; (ii) conventional solid-liquid extraction like maceration, Bligh-Dyer and Soxhlet extractions; and (iii) non-conventional extractions such as microwave, ultrasound and supercritical fluid extractions using either petroleum solvents like hexane and petroleum ether or MeTHF as green solvent for the first two techniques and CO2 for the last one. Cold pressure, supercritical fluid and green solvent extractions afforded the safer oils while Soxhlet extractions give the better yields. In order to evaluate the compositional quality as well as the nutritional and sensory properties of DSOs, several physicochemical properties like refractive index, color perception, melting point, viscosity, iodine value, saponification value, and peroxide value were assessed. Date seeds contain between 3 and 16.5% oil. DSO contains different types of fatty acids (FA) from which the most abundant were oleic (C18:1 ω9; 25.89–55.10%), lauric (C12:0; 8.4–45.88%), linoleic (C18:2 ω6; 2.47–19.23%), palmitic (C16:0; 8.3–16.22%) and myristic (C14:0; 0.04–18.76%) acids of which oleic acid is the predominant. Lauric and oleic acids are the main saturated and unsaturated fatty acids of DSO respectively. Other FAs exist in trace level. DSO has low acidity (0.15–0.90%) and low peroxide value (3.16–6.91 meq O2/kg) allowing its possible use in food applications. DSO could resist thermal treatments for long period (30–40 h long) and could be utilized in frying and cooking. Additionally, DSO contains tocophereols and tocotrieneols which together exist in an average of 70.75 mg/g oil. Phytosterols exist also in minor amounts in DSO and constitute most of the unsaponifiable matter of which β-sitosterol was found to be the predominant (76%) followed by Campesterol (29.90%) and Δ5-Avenasterol (29.56%). 96–99% of DSO is triacylglycerids composed mainly by LaMM + LaLaP with 18.9% of relative composition followed by LaMP + MMM (15.31%), LaOO + PLL+ MPL (12.86%) and LaPO (11.33%).